If you are headed to ski on one of Bosnia and Herzegovina’s famous mountains, here’s three locations you just can’t miss. Bjelasnica’s claim to fame came when it was used during the 1984 winter Olympics, including downhill events. If you are trying to choose between Bjelasnica and Jaborhina for your skiing vacation, it’s best to consider your skill level. Bjelasnica offers fewer trails, but if you crave a challenge, ski there first. You’ll find a slightly less forgiving climate that will add to the challenge of the trails! The steepest of Bjelasnica’s slopes from 2,000 meters to 1,200 meters at its base. The fabulous thing about Jahorina is the learner-friendly environment. Whether you are very skilled or just starting out, you can hire an instructor to fine-tune your skills at some of the best trails in Eastern Europe. There are over 20 km of tracks at your disposal for skiers at any level, so Jahorina has trails for everyone. 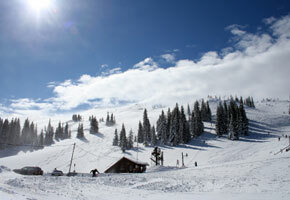 Rent a mountain apartment or chalet for a complete skiing weekend at Jahorina. Besides traditional downhill skiing, you can also take advantage of lots of other winter sports including cross-country skiing, night skiing, snowshoeing, ski jumping, and snowshoeing. If you’re traveling alone or crave the convenience of a hotel, book into the Bistrica hotel for real pampering including a jacuzzi, roaring fireplace, boutique, and bar. Wake up early to go straight out to the trails, which are located just 150 meters away from the traditional chalet-style buildings. For slightly more budget accommodation, stay at the Bistrica. It is located even closer to the ski lefts to get you on the trails early, and their community-style lounge and restaurant will warm you up after a hard day of skiing. Igman mountain is the shortest of all the mountains in Sarajevo, measuring up at 1,502 meters or 4,928 feet. If you plan on traveling with children, you’ll appreciate their kid-friendly slopes and trails. Along with the other two mountains of Bjelasnica and Jahorina, Igman mountain was the location of the 1984 Winter Olympics. Stay in the nearby village of Ilidiza, the seventh-largest city in Bosnia and Herzegovina. The flat terrain surrounded by mountains is very impressive, and you can get some cultural sightseeing accomplished in the region on skiing breaks. This region has heavy influence from the Ottoman empire, and as a result, still has traces of Turkish architecture within the city. Drive to Jahorina, Bjelasnica, or Igman from Sarajevo. It should take about thirty to forty-five minutes, so if you crave a break from skiing, head back into the city for dinner, dancing, and the arts before getting back on the mountain.